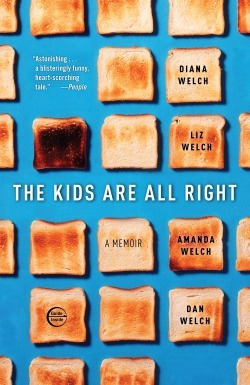 Over the weekend, I finished reading The Kids Are All Right by Diana and Liz Welch, with Amanda and Dan Welch. The memoir, in which the four Welch siblings take turns writing chapters, tells the poignant, often heartbreaking story of their once-normal childhood turned upside down by the deaths of their beloved parents: first their father in a car accident, then their mother of cancer. Many of the chapters scrunched up my heart and made me wonder, as The Glass Castle by Jeannette Walls did, how children come through such things and grow into seemingly whole, functional, successful adults. One chapter in particular gave me pause, stopped my heart, brought tears to my eyes. Not wholly out of sympathy for the Welch kids, though, but because it rang eerily similar to an incident from my childhood. Soon after the death of their father, the Welch children's mother encouraged a relationship between Amanda, the eldest daughter, and a young man named Duncan. Mom hoped a masculine presence would be good for her son, Dan, so she was pleased with the progression of the budding romance between Amanda and Duncan as it led to Duncan's regular visits to their home. One night while Amanda, Duncan and Liz, the second oldest sibling, shopped for groceries, Duncan shockingly professed to Liz his love for her while Amanda was in another aisle. Once home with the groceries, he continued elaborating on the inappropriate confession to Liz, cornering the young girl in the pantry and asking her to make it "their secret." Instead, the scared Liz told Mom. Mom immediately banished Duncan from the family, leaving Liz to worry that Amanda would blame her, hate her. When Amanda learned of Duncan's come-on to her sister, though, all she said was, "What a jerk." No anger, no disappointment ... at least not toward Liz. She renounced Duncan. She stood by her sister. When I was 13 years old, my parents were divorced and I occasionally stayed with my dad. My younger siblings did the same; my older sister much more sporadically. Once when I spent the weekend at Dad's, my older sister and her even older boyfriend returned from a night of partying and climbed the stairs to where our bedrooms and a bathroom were. My sister headed into the bathroom; her boyfriend headed into my bed. He aggressively snuggled up to me, trying to climb on top of me. As I woke from my deep sleep and grasped what was going on and the danger I was in, I pushed and kicked at the boyfriend, trying to get him away from me and out of my bed. My sister emerged from the bathroom, heard the rustling and came into my dark room. She turned on the light, saw her creepy boyfriend in my bed and started screaming and screaming -- at me. In her drunkenness and insecurity, my older sister thought I had somehow lured her boyfriend into the compromising position, was somehow trying to steal him away from her. The vitriol spewed from her drunken mouth ... and continued for weeks. My sister was mad at me -- stayed mad at me -- instead of being mad at the jerk she'd unknowingly stopped just short of molesting her little sister. I often wonder how different things might have been if my sister hadn't come into the room just in the nick of time. And I often wonder how different things might have been -- for both of us -- if my sister had done like Amanda in The Kids Are All Right, if she had renounced the inappropriate lout and stood by her scared little sister. Disclosure: I received a FREE copy of The Kids Are All Right from the publisher for participation in the From Left To Write book club. How would you describe your relationship with your siblings?